Innovations play important role in our daily lives. It is not surprising that they also became vital for businesses. Modern technologies are facilitating the routine tasks directly related to the effective functioning of a company. The main goal of their introduction into business processes is to increase profits while reducing various costs. The choice of specific technologies and their integration into the company operations affect the development strategies, a company’s sustainability and the process of attracting new customers. Many established enterprises are afraid of using new tech trends because they do not want to lose their money investing into something untested. Indeed, the introduction of new technologies requires notable starting investments. Regardless, these funds can easily pay off thanks to a decrease in operating costs and subsequent optimization of the company’s performance. A closer look at the latest technologies, provided in this article, will give you an overview of the most promising current trends and help to select ones suitable to include in your business development strategies. In classic science fiction, sentient machines are often used as a part of dystopian settings and presented as antagonistic to humans. Nevertheless, the current influx of AI-based technologies and self-learning algorithms is directed at pure practicality. We can see that self-driving cars, chatbots, and voice-controlled assistants already are becoming a part of our everyday life. 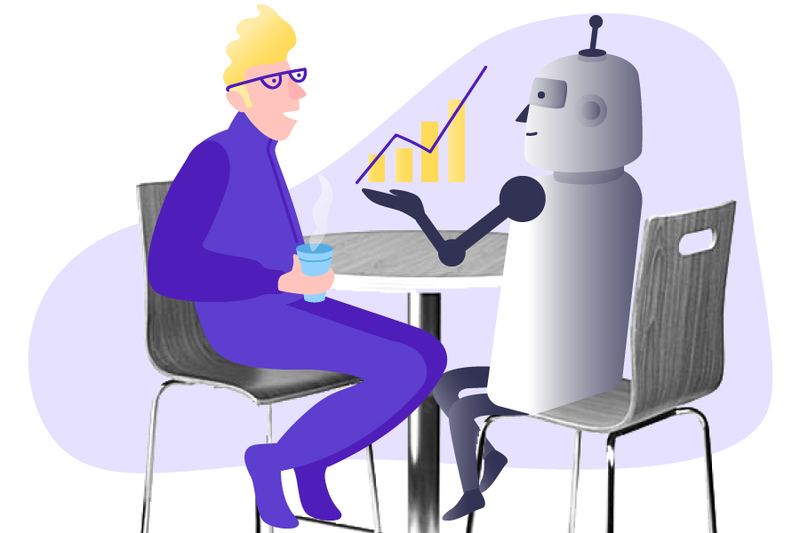 AI routines are an important element of many solutions and it is obvious that in the nearest future even small companies will interact with this technology. As opposed to ideas expressed in fiction, there is nothing to be afraid about current day AI. It is better to explore its functionality and create a concrete plan on how to use it to solve your specific tasks. For instance, predictive analytics can be very helpful in order to maximize the efficiency of procurement. If you run a restaurant, you can think of using driverless cars for food delivery. If your company struggles with accurate bookkeeping, you can use AI to optimize the accounting. Firstly, you have to define your specific aims, and only then, try to find a tech solution applicable to your requirements. The application of VR to commerce is still new, however, it is already clear that it will change the usual ways of doing business. The only question is when this technology will become mass available. Let’s look at just a few examples of the ways in which virtual reality and related technologies can help startups in the nearest future. The use of virtual reality in employee training can reduce costs, eliminate the danger of trauma, and increase the efficiency of the process. In the virtual world, one facilitator would be able to teach numerous new workers at the same time. It is assumed that the communication provided by the technology is more attractive and acceptable than phone calls or video conferences. What makes using VR effective for employee training is also suitable for co-working within the same company. Team members from different corners of the world could meet in a virtual conference room. Thus, renting a spacious office with a conference room would become unnecessary. Cooperation is an important part of literally every job. However, each person sometimes feels the need to focus on their own tasks without distractions. Virtual reality can allow employees to slip into their own world and focus on their tasks and thoughts. In the future, everyone may have their own virtual office. VR technology can be very beneficial for many types of start-ups. However, let’s take a closer look at one example, touristic business. Even now many people are using the Google Street View service before going to the new places. Months before the trip we can find out everything about the planned area – notable landmarks, tourist attractions, famous sights, hotel suite interiors, etc. Blockchain as technology and Bitcoin, the first crypto-currency based on it, became a hot topic only couple years ago but continues to develop and form even now, inspiring numerous discussions among IT professionals and enthusiasts. In itself, blockchain is a continuous sequential chain of blocks containing information. Currently, it mostly is employed in a variety of crypto-currencies. However, it can be programmed to record not only financial transactions but practically any valuable data. Major benefits of blockchain storages are high fault tolerance, maximum security, and the impossibility to forge the stored information. The term “Internet of Things” (IoT) refers to consumer devices which are able to connect/interact with each other and the external environment using local area network and internet. Nowadays, the technology is mostly used for “smart home” systems: household appliances and various sensors are combined into a unified network which allows controlling electricity, heating, security, and fire protection systems, cooking and multimedia devices, etc. To put it shortly, this technology automates the house and makes our everyday life more convenient. Other application spheres include medical services, transport systems, industry, and business. Such a modern concept as “smart city” is also largely based on the capabilities of IoT devices. In the manufacturing sector, industrial IoT technologies will help to track all stages of production, implement effective solutions and improve the quality of products. In agriculture, IoT technologies are used to monitor the state of animals, plants, and the environment. Already, farmers around the world started to use smart sensors which monitor temperature and humidity, suggesting the best time to fertilize plants or harvest. The building sector can use technology to track the condition of houses, bridges, roads and the impact of environmental factors. Sensors can collect data about light intensity, vibration, weather conditions to prevent possible damages. IoT can also be used for medical purposes. Smart medical devices monitor the patient’s condition in real time. And last but not least, IoT technology offers certain benefits for businesses. Now, it will be easier to collect the data related to the customer’s interaction with the devices, applications or services. With the help of IoT devices, it will be possible to complete the large-scale tasks much faster and with fewer errors. Big data means extensive volumes of unstructured data that cannot be efficiently processed using the customary software tools. Although big data is not a new concept by itself, methods, tools, storages, and hardware capabilities suitable for its collection and analysis started appearing relatively recently. A breakthrough is associated with the launch of the free Hadoop platform which includes libraries, utilities, and frameworks for big data processing. Now, Hadoop components are used in commercial platforms and systems of big companies like SAP, Oracle, and IBM. Today, the term big data refers not only to the datasets themselves but also to tools for their processing and the potential benefits that can be obtained as a result. The main characteristics that distinguish Big Data are three V: volume, velocity, variety. The first refers to the large volumes, the second is for fast data processing and accumulation, and the third means diversity. Using big data technologies in the retail sector, for instance, allows collecting a variety of information about every customer, their purchase history, the discounts which attracted them, shop visits and much more. Analyzing this data, we can build their psychological portrait and discover their preferences to customize service, advertising, and propositions to better serve their needs. In telecommunications, big data allows controlling the state of the base equipment and connected devices and timely discover faults and possible problematic sectors. Big data simplifies planning, optimization of company efficiency and provides various opportunities to interact with customers. The introduction of popular innovations in business is a far-sighted decision because with their help you can achieve rapid development of the company, increase profits, workforce participation and efficiency, reduce various production costs, etc. You can come up with a new way of implementing these technologies and become a leader in your field. IDAP provides the complete range of services in the field of modern IT and software development. Our team has considerable expertise in the implementation of complex technical solutions in different business sectors. Whether you are interested in IoT technology or Virtual Reality, we can integrate the up-to-date tools to help your business grow. The latest tech trends can optimize your company’s management, automate production and office processes, decrease expenses and boost customer loyalty. Our experienced team are always ready to counsel you and help in choosing the most suitable solutions tailored for your specific requirements. Contact us today and bring your business to the new level!